Our suppliers include: Lever, Beiersdorf, Procter & Gamble, Sara Lee, Colgate, Wilkinson, L'Oréal, Henkel, Gilette en and many other large and small brands. With this website we would like to give you insight into our organization and what we can do for you and your organization. 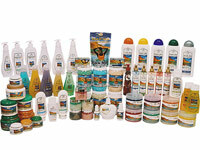 Goldmaster Cosmetics was founded in 1980 and has since been a good and reliable reputation in the buying and selling of stocklots.